Volvo Car Group’s “Drive Me” project — featuring 100 self-driving Volvos on public roads in everyday driving conditions — is moving forward rapidly, with the first test cars now driving around the Swedish city of Gothenburg. “The test cars are now able to handle lane following, speed adaption, and merging traffic all by themselves,” says Erik Coelingh, Technical Specialist at Volvo Car Group. What makes the ‘Drive Me’ project unique is that it nvolves all the key players: legislators, transport authorities, a major city, a vehicle manufacturer, and real customers. The customers will drive the 100 cars in everyday driving conditions on approximately 50 kilometers of selected roads in and around Gothenburg. These roads are typical commuter arteries, including motorway conditions and frequent queues. Volvo Cars will play a leading role in the world’s first large-scale autonomous driving pilot project in which 100 self-driving Volvo cars will use public roads in everyday driving conditions around the Swedish city of Gothenburg. 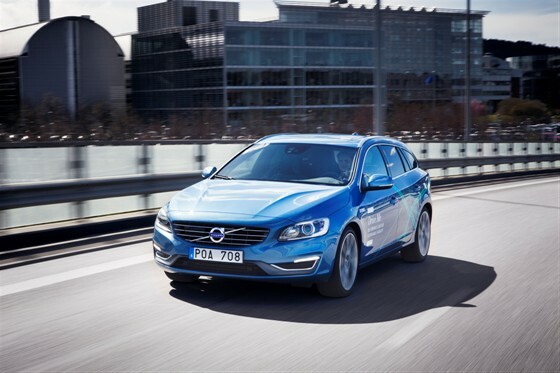 The ground-breaking project ‘Drive Me — Self-driving cars for sustainable mobility’ is a joint initiative between Volvo Car Group, the Swedish Transport Administration, the Swedish Transport Agency, Lindholmen Science Park and the City of Gothenburg. The ‘Drive Me’ project is endorsed by the Swedish Government. The aim is to pinpoint the societal benefits of autonomous driving and position Sweden and Volvo Cars as leaders in the development of future mobility. Could emotion detectors make driving safer?